How can I avoid bubbles inside or on the surface of the cast piece? Bubbles in cast glass are a typical problem. Working with frit or other fine components will lead to a lot of small air pockets between the granules. When heated to fusing temperatures these air pockets will become round bubbles. As you increase the temperature the bubbles will grow bigger and start to rise to the surface. To stop this from happening, make a long soak at approx. 670°C (Ramp II). At this temperature the glass surface is still porous and the air can escape before the glass starts to fuse. How can I avoid having the sharp needle points at the edges of the cast piece? The needle points are a typical result when the glass is sliding down the mould side during the melting process. Try to place the glass in the middle of the cavity forcing the glass to melt without touching the mould walls. Needle points can be cold worked using polishing pads / tools or a grining / polishing machine. The glass surface is dull. What can I do to make it more shiny? The surface of a cast piece of glass always takes the texture of the mould. On the sides touching the mould you will always have a certain cloudiness, which is basically the very fine texture of the kiln wash.
To obtain a glossy surface you will need to coldwork the piece, using polishing pads / tools or a grinding / polishing machine. Can I use the same kiln wash for more than one firing? Most casting processes are done at high temperatures with longer holds, which means that the kiln wash has lost its separating effect after the firing. Therefore we recommend to replace the kiln wash for every firing. Do casting moulds need kiln wash? Our reusable casting moulds require kiln wash. Most commercially available kiln wash qualities will work fine. Do not use Thin fire paper or dry primer. Can I use the recommended firing cycles if the glass is much thicker than 6-9 mm? You can use the same cycles and slumping temperatures, but you need to extend the first ramp up to the fibre softening point, the annealing and final cooling. How many firings can I expect from one mould? Do they deteriorate over time? Is there a maximum temperature? Our moulds are made for many firings, up to several hundred cycles without any loss of quality. The mould should not be fired above 1000°C. I need to fire different pieces, all requiring different slumping temperatures. Can I fire them in the same firing at an average temperature? You may try this, but it is best to choose the lowest recommended slumping temperature with an extended hold. Remember you can always re-fire a piece but you cannot easily rescue an over-fired piece. Is there a risk of devitrification in a slumping process? Do I need to use overglaze? Most slumpings take place at temperatures below the devitrification range, therefore there is no need for overglaze. Can I use thin fire paper or other types of kiln wash? Most commercial water based kiln washes are perfect. Thin fire paper works fine for some moulds, e.g.958.042 Simple Curve etc. Dry powdery primers do not stick to the mould surface and can also create a dusty ‘atmosphere’ which may lead to ‘dusted’ glass edges. The glass has picked up kiln wash during the slumping process. What went wrong? Can I rescue the piece? Kiln wash residue suggests that the piece has been over-fired or that the kiln wash coating has not been replaced. You can sandblast the residue and re-fire the piece on the mould. Do I have to replace the kiln wash for every firing? Slumping temperatures below 720°C allow 3-4 cycles with the same kiln wash. See general instructions. Do the moulds have to be pre-fired before first time use? Most moulds do not require pre-firing. For larger moulds a slow pre-firing is recommended, see general instructions. Can I add more vent holes to the mould? Almost all our moulds have at least one vent hole, but adding more is fine. The ceramic material can be drilled with a standard metal drill bit (diam. About 2-3 mm) using an electric drill. The slumped piece is distorted and has bubbles or holes. What went wrong? Can I rescue the piece? Bubbles or holes are usually the consequence of clogged vent holes in the mould or if the air could not escape through the base of the mould. We recommend to always place the mould onto kiln posts to make sure that the air (between the glass and mould) can escape and that there is good air circulation all around the mould. This guarantees an even heat transmission throughout the glass. Distortions and bubbles are also typical if the slumping temperature has been too high. The basic rule is to slump at the lowest possible temperature with a long hold. If a piece is not slumped enough, you can always do another firing. A mould has cracked during the slumping process. What went wrong? Can I fix the mould? A cracked mould is typically a result of a thermal shock. Our moulds have an extremely good resistance to thermal shock, but a mould placed too closely to a heating element may not withstand the uneven heat transmission. This is especially important in side firing kilns. Make sure to leave enough space between mould and heating element and heat / cool slowly and as evenly as possible. A crack in a mould can easily be fixed with hi-temperature glue and refractory cement. Put the glue on the mould underside and sand off excess glue on the surface after the firing. I am working in a side fired kiln. Can I use the same firing charts? The recommended slumping temperatures are largely the same, but you may have to extend the time / reduce the speed in the Ramp I. The piece has cracked during the slumping process. How can I stop this from happening? a) If the crack shows soft (rounded off) edges, the breakage has happened during the first ramp up to 520°C. Solution: Extend the time / reduce the speed in Ramp I.
b) If the pieces have sharp edges, the breakage has happened in the final cooling. Solution: Extend the time / reduce the speed in the cooling Ramp IV (and V). The edges of the slumped piece are thick and rough. What do I do? You can always try to re-fuse the piece, but you may lose the original shape and design features. Can I cut the glass smaller or bigger or a different shape than the mould? 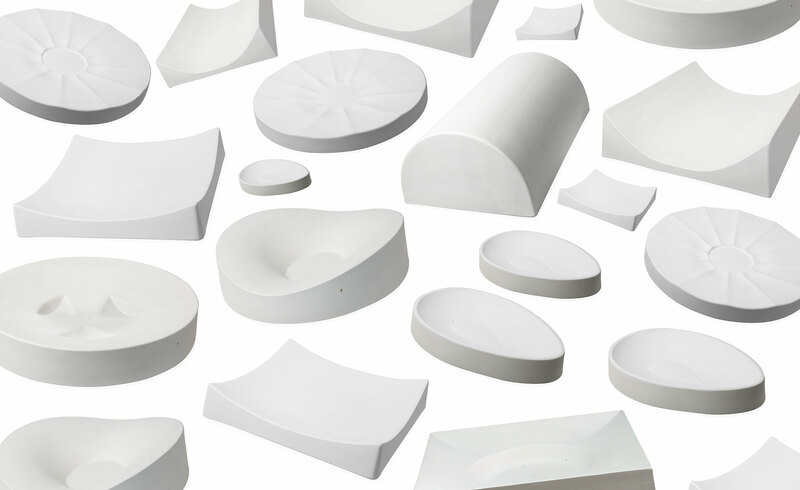 For our ceramic moulds we recommend the glass to be the same as the mould size or smaller. If the glass is larger than the mould, the edges of the glass may drape over the edge and grab. During the cooling, the glass will shrink more than the mould (glass has a higher COE than ceramics) and may crack. When cutting the glass, please remember that our moulds are hand made. Small variations in size may be possible. We recommend to cut the glass to the actual mould size rather than relying to the sizes shown in the catalogue or the product sheet. Changing the glass shape may actually lead to a discovery. Many of our moulds lend themselves for slumping other shapes resulting in a new and different glass object. Especially when slumping into a deeper mould make sure to avoid over firing. When this happens, the edges will ‘roll in’ and form a thick ‘lip’ and may also pick up kiln wash from the mould. You can sandblast off the kiln wash residue, but you cannot reverse the loss of shape. For your next piece, reduce your slumping temperature or reduce the hold. Visually check the slumping process. The slumped piece has not properly slumped into the mould. Can I fire a second time? A second firing is no problem. Try a slightly higher temperature or a longer hold at the previous slumping temperature. If necessary replace the kiln wash.
Is there a firing recommendation for any type of glass, mould or kiln? The slumping temperature always follows the shape of the mould, the viscosity of the glass and the heat source. The slumping temperatures range from 600°C up to 800°C. The basic rule is to slump at the lowest possible temperature with a long hold. Try to avoid over-firing, as an over-fired piece cannot easily be rescued. If a piece is not slumped enough, you can always do another firing.